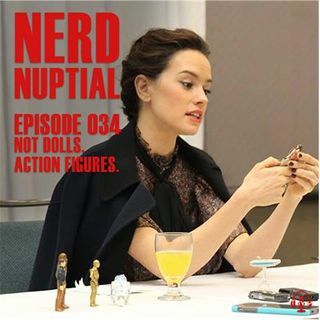 Episode 034 - Not Dolls. Action Figures. Even though we're a day late, the Nerd Nuptial pairing is back and ready to deliver this week's show. Whether it's onscreen, on TV, or especially in life, representation matters. They start the show talking about Rey's action figures and then move onto representation for young girls, specifically one they have in mind. They finish the episode with the trend #DescribeYourselfWith3Fictional characters. What are your 3 fictional ... See More characters?